Now more than ever, DIY wedding favour boxes are becoming outstandingly popular choices up and down the UK. 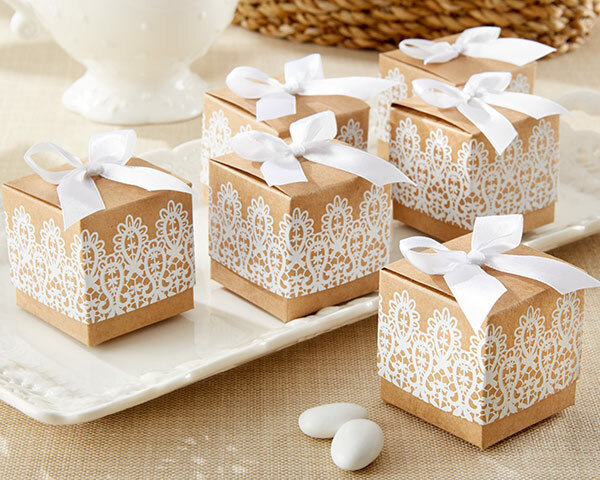 Much of the popularity of the DIY wedding favour box is the direct result of the way in which web retailers are making it easier than ever before for wedding planners at all levels to get their hands on everything they need to create fantastically unique gift bags and boxes. What may once have seemed like an overly expensive and time-consuming task has been made simpler and indeed more enjoyable than ever before, ushering in something of a wedding favour revolution that took the nation by storm. Of course, some would argue that there’s really no sense in giving yourself yet another job to do when there are plenty of services out there that can do it on your behalf. Nevertheless, it isn’t until you’ve actually tried your hand at creating genuine DIY wedding favours that you begin to understand just how advantageous it can be compared to the conventional alternative. First of all, trying to create the perfect wedding favours via a third party provider has the potential to be considerably more difficult and time-consuming than it may appear. The reason being that there will inevitably be a great deal of toing and froing when it comes to deciding exactly how the favours should be presented, decorated and embellished. What’s more, you will undoubtedly want to request samples before going ahead with the full order which may mean additional delays with postage, any changes you wish to make and so on and so forth. By contrast, and indeed contrary to popular belief, taking the DIY approach has the potential to save you time as it is simply a case of ordering in all the bits and pieces you need in one bulk order and then putting them together exactly as you want them. One order, one delivery and one final result – all in your own time and at your own pace. Unsurprisingly, the single most advantageous benefit of choosing the DIY approach to wedding favours is the way in which they have the potential to save you a small fortune. This of course comes down to exactly what you choose to put in them and the retailer you source everything from, but more often than not it will always cost less to put together your own wedding favours than to order them as finished items from a vendor. Never forget that they can be as simple as you like as with these kinds of gifts it is always the thought that counts more than anything else. One of the main problems when it comes to sourcing wedding favours from established retailers is the way in which you are to some extent limited in terms of the gift items and contents available. Chances are there will be plenty to choose from, but when it comes to giving something genuinely meaningful that in some way connects to the couple giving the gifts, it often works better to go down the DIY route. For example, all the chocolates and cakes in the world bought from standard retailers will never mean quite as much as just a couple of handmade sweet treats made personally by the couple for each of their wedding guests. Another benefit of creating your own wedding favours is the way in which it makes it much easier for you to ensure that they coordinate perfectly with all other decorative items and the general theme of your wedding across the board. Rather than being limited to the designs and styles available from any given retailer, you have the ability to customise and personalise everything from top to bottom to ensure a genuinely flawless fit. And what’s more, you can even make your wedding favours into centrepieces or decorative place settings in their own right in order to gain even more value for money. 5 – It’s a Blast! Last but not least, throwing financial and logistical benefits to the side for just one moment, it’s really worth remembering that creating your own wedding favours is genuinely and uniquely enjoyable. The fact of the matter is that this is the kind of thing most people will only ever get to do once in their lifetime and carries the same kind of excitement and anticipation as wrapping presents ahead of Christmas day. It’s a brilliant way of stirring up emotion and excitement in the weeks and months running up to the wedding, so why would you give this privilege to anybody else?